In our ongoing coverage of Denuvo, the DRM once thought unbeatable that since has been very much beaten in record timelines, one internet handle wove a common weave through most of those stories: Voksi. Voksi, a singular human being, had done much of the work that had brought Denuvo to its knees. In fact, we recently wrote a post about how illuminating it should be when corporate DRM makers with the kind of financial backing of Denuvo could be brought down essentially by one guy with a grudge. The lesson there was if that was the state of things, it was a clear sign that Denuvo's entire business was on shaky, unsustainable grounds. Denuvo appears to have taken the opposite lesson instead, believing apparently that this one grudge-haver was something of a single point of failure in the anti-Denuvo realm. To that end, Denuvo has recently, and quite gleefully, announced that it worked with Bulgarian police forces to arrest Voksi and seize his equipment. Denuvo said that Voksi’s arrest came about through the dual efforts of Denuvo parent company Irdeto and the Bulgarian Cybercrime Unit. “The swift action of the Bulgarian police on this matter shows the power of collaboration between law enforcement and technology providers and that piracy is a serious offence that will be acted upon,” said Irdeto VP of cybersecurity services Mark Mulready. Voksi himself announced his arrest on Reddit. It seems likely that the folks in Denuvos executive offices are popping champaigne bottles. They shouldn't be. Sure, the company certainly can go after this one lone hacker with a grudge against its software. The real question is whether this will solve Denuvo's problems. It won't. Not by a long shot. 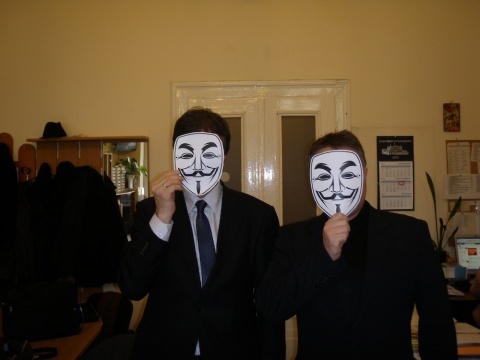 The reason for that is first and foremost that Voksi has been quite good at communicating with the public as to his motivations, and their are something akin to internet populism. If that reads like the statement of a martyr, it's because that is exactly what Denuvo has created in Voksi. Does anyone really doubt that others will take up his efforts? And in more numbers than when it was just one lone guy with a grudge? Who out there wants to predict that, on the long timeline, the forthcoming headlines will now be all about how Denuvo iterations are secure and impenetrable once more? In a world where one guy caused all this chaos that led to his arrest, it should be obvious that any such prediction would be laughable. So what has Denuvo achieved in any of this? Anything at all? When an idea fails, legislators resurrect it. The problem must not be with the idea, they reason. It must be with the implementation. So it goes in Europe, where the Bulgarian government is trying to push an idea that has demonstrably failed elsewhere on the continent. The failure of snippet taxes/Google taxes is well documented, but never seems to deter further legislative efforts in the same direction. Google reacted to the initiative by dropping snippets from German news agencies, a move that produced a noticeable drop in traffic. German publishers called it "blackmail," but the simplest way to comply with bad laws is to opt out. Similar things happened in Spain with its snippet tax. Google nuked its local Google News service, resulting in affected publishers demanding the government force Google to re-open the service and start sending them traffic/money. This push in the EU Commission for a snippet tax deliberately ignores research showing link taxes don't work, harm publishers, and are opposed by many of the journalists who would supposedly benefit from it. This is more than cherry-picking facts to support a Google tax. Pirate Party EU Parliament member Julia Reda (who wrote the post quoted above) previously uncovered reports the Commission tried to bury, including one that showed news aggregation services like Google News were a net benefit for listed publications. At this point, it looks as though some form of snippet tax will eventually become EU law. Only half of the member countries oppose snippet taxes, and only a few of those are actively fighting the proposal. If it does become law, it won't work out the way publishers believe it will. Instead, it will harm smaller publishers and smaller aggregators, resulting in a consolidation of power for the largest publishers and platforms. The EU has no leverage in this battle. Google won't hang around for long if the situation is unprofitable and publishers will have to settle for taxing Yahoo, Bing, etc. for whatever traffic these search engines manage to send their way. The Bulgarian National Radio [BNR] and copyright organization Musicautor remain at loggerheads over music fees, with officials being cautious in their reaction. Since January 01, the public radio is barred from playing more than 14 000 000 musical pieces from around the world and plays mostly classical music, jazz and folklore music. the demand from Musicautor is a burden on [BNR's] budget and "does not rest on economic realities". He accuses the organization of abusing its monopoly over copyright and warns if the radio were to agree, it would have to take one of its regional programs off air, infringing on the public interest. Just because copyright collection societies have succeeded in squeezing fat licensing fees out of public broadcasters in other countries doesn't mean that this is some inalienable right everywhere. Rather, it reflects the power -- the monopoly power, in fact -- of a collection society to threaten to stop people listening to millions of the most popular tracks on their national radio stations, however unreasonably, simply because it can. Bulgaria's Constitutional Court ruled on March 12 to declare provisions in the Electronic Communications Act mandating the bulk collection of telecommunications data as unconstitutional. "On the data retention directive, the European Commission does not plan to present a new legislative initiative," Dimitris Avramopoulos told a news conference in Brussels. It's worth emphasizing that this does not mean bulk data retention is dead in the EU. As an earlier Techdirt post explained, the EU's Member States can still bring in national laws requiring data retention, but those can be challenged in the courts in the light of the CJEU decision, as is already happening. In practice, this means that there is likely to be a wide range of requirements for data retention across Europe, ranging from the most extreme in the UK, for example, to those countries that accept that such mass surveillance is not just intrusive but also ineffectual. Earlier this month, Tchobanov and Yordanov’s news outlet Bivol.bg, which publishes documents from their WikiLeaks-like leak site BalkanLeaks, received a letter from Bulgaria's central bank threatening to fine the news organization for publishing "false information and circumstances" that undermine the "reputation and credibility" of four Bulgarian banks that filed the complaint with the government -- a violation could carry as much 150,000 Bulgarian lev ($100,000) in penalties. The article consisted of an analysis of a US embassy cable published by WikiLeaks about "bad apples" in the Bulgarian banking system, but it corroborated the US ambassador's comments with information from its own sources. "The Credit Institutions Act concerns only the banking world and cannot be used against the media or to defy the constitution, which guarantees media freedom. Moreover, the BNB has no jurisdiction over media law and cannot be allowed to impose heavy fines on news outlets." Using the same anonymity tools as WikiLeaks, the group has obtained leaked documents exposing judicial bribery, former members of the Soviet-tied secret police, and blackmailing between Bulgarian prosecutors. After obtaining and publishing a State Department cable on Bulgarian organized crime the group received from rogue WikiLeaks ex-associate Israel Shamir last summer, Bivol partnered with WikiLeaks to release the rest of the Bulgaria-related cables. One accused Bulgarian prime minister Boyko Borisov of close mafia ties, a claim he vigorously dismissed in a Bulgarian TV interview as "yellow journalism." At a time when many people are wondering whether WikiLeaks is a spent force, it's heartening to see BalkanLeaks and Bivol.org continuing to expose wrongs through the use of leaked information, despite the very clear risks. "Since there are no damages for society, I believe the move is sufficient as a sign of assuming responsibility. I was convinced that this agreement would be beneficial for Bulgaria. Even now experts say its positive effects would outweigh the negative ones." "The PM further vowed that the Members of the European Parliament from his ruling, center-right Citizens for European Development of Bulgaria party, GERB, would not endorse the ratification of ACTA." What is certain is that the nationwide protests last weekend such as in the video below, which saw impressive numbers on the streets of 16 cities in a country of 7.5 million people, have startled the government sufficiently to understand they need to be more wary about the types of treaties they sign, especially when those treaties infringe on civil liberties. While proponents of stronger IP protection get more audacious, an increasing amount of people are taking to the streets to hold their governments accountable for signing these treaties or comparable laws. 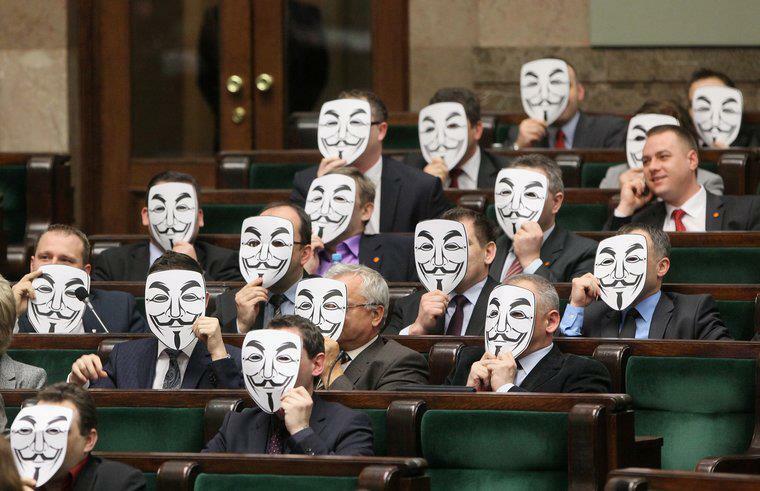 We recently pointed out that a bunch of Polish politicians wore Guy Fawkes/Anonymous masks in Parliament to protest ACTA: It appears that some politicians in Bulgaria thought that was a good idea, and have done the same thing: It's really quite fascinating how much of a meme this has become within politics. While some still like to pretend that Anonymous is just a bunch of vandalizing kids, it certainly seems that some of what Anonymous stands for is having a real impact. I still think that the DDoS attacks are dumb and do more harm than good, but it's quite fascinating to see the wider ideas of what Anonymous is fighting for percolate all the way up into politics around the globe. This one's a bit scary. Security and cybercrime researcher Dancho Danchev, who has blogged about organized crime and online terrorist activities, has apparently been missing since September. ZDNet, where he sometimes blogged, has published a notice asking for help tracking him down, and publishing an email he sent shortly before he disappeared. That email included photos of a device he found planted in his bathroom, that he believed was from Bulgarian intelligence services. ZDnet has been trying to reach him for months -- and recently received information from a source in Bulgaria that Danchev is alive "but he's in a lot of trouble." If The Public Library Was Invented Today, Would The Gov't Call It Organized Crime And Shut It Down? We've seen authors in the past complaining that libraries are engaged in book theft, which is an argument that is pretty laughable -- though, has, at times been suggested by various publishing groups. But, in general, most people recognize the public service a library does by helping to educate people. So when some folks in Bulgaria decided to try to set up a user-generated online library of sorts, you wouldn't think that the site would get raided by the police, be declared "damaging to culture," and have its organizers described as an organized crime syndicate. But, that's what happened. The site, Chitanka.info let anyone upload works for a Bulgarian audience -- so there definitely were some infringing works on the site. However, the site was quick to take down any material upon request. The effort was strictly non-commercial, with no ads appearing anywhere on the site. In fact, many authors uploaded their own works, as they realized what a great resource it was. "Anybody that has ever read a book on a screen knows that it isn't very comfortable. So, lots of paper books have been bought, because when someone starts reading on the screen, likes the book, but is not comfortable, he goes to the book shop and buys it." There's a great detailed legal analysis of Chitanka's position, noting that the law is a bit ambiguous here, but the site may have a reasonable defense, and qualify as protected under safe harbors by making its works "publicly accessible" as a library. Either way, all of this makes you wonder: if traditional public libraries were just being founded today, how much effort do you think publishers would go through to shut them down by claiming they were illegal and violations of copyright law?